This week is Comic Book Movies Week here at the Cube, where we name our favorite movies based on comic book properties. Today, Matt makes a rare appearance and names his favorite comic book movies. With Man of Steel soon to come out, the fearless leader has asked each of us to ruminate on movies based on comics that we’ve actually enjoyed. Given that crieteria, I am sad to say, few DC movies make the cut, actually none. I’ve discussed the translation of comics to movies before, and sadly, not much has changed. I racked my brain for a DC movie I enjoyed without reservation, but they were sadly deficient. I (shockingly) enjoy the Nolan Batman movies, but they aren’t great Batman or comic movies, so they don’t make the cut. I enjoyed films like V for Vendetta, but somehow, it seems to me that the novel and movie are just too different from the expectation I have when you say a movie about a comic, that they belong in a separate category. My criteria for the movies was that they were major studio releases and not direct-to-video. Sadly, this last criterion cut out a lot of films. My list is also of fairly recent origin, but I also don’t think most of the historical comics movies were particularly well-done. Adam West’s Batman is a different animal and I’m sure there are other’s people like, so enjoy their posts! I was skeptical of Captain America as a movie at first. The character is essentially a steroid freak who is Marvel’s boy scout analog. 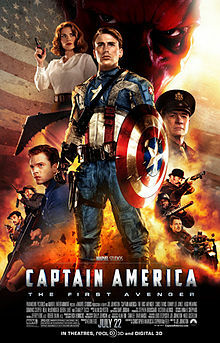 To counter the possibility of making Cap a laughing stock in the modern world, I think Marvel was wise in choosing to set the newest movie primarily during World War II. It’s when Cap began and fits his initial personality. Plus, as they say, you begin with the beginning. The story sets Steve Rogers up by showing and telling in a good mix. You see him as a scrawny little guy who wants to fight, but is constantly blocked and bullied. They were so effective at this, I didn’t realize Chris Evans was CGI’d to mouse-like size originally, much to my embarrassment. Stanley Tucci is great as Dr. Erskine. He adds warmth and humor to the character. Once the transformation is complete, with requisite chase scene, you get to enjoy the frustration a man can feel from punching Hitler once a night and twice on Sundays. The movie enjoys its nature as a buddy, adventure flick. It creates a believable environment, reasonably faithful to the comics origins and immerses the viewer in the world. The final scene of Rogers waking up in modern day New York is striking and the look on his face believable. Evans is a great Cap and it entirely makes up for the lackluster nature of his Fantastic Four movies. Thor, or Thor God of Thunder as he is referred to in my head, can be something of an awkward character in the comics. He is very much out of place in the human world and that could make his story unrelatable or the character simply too distant to make sense in a movie setting. Fortunately, the film was directed by Kenneth Branagh, who knows a thing or two about grandiose characters from his Shakespearean experiences. Thor is grand, cosmic and full of archaic speech. 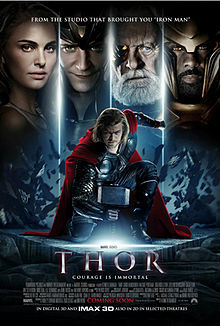 Despite these drawbacks, the film does a great job of displaying Thor’s immaturity and Loki’s deviousness. Brash actions and subterfuge move the plot along and the emergence of Agent Coulson doesn’t hurt. The interaction of Thor and other Asgardians with normal humans (your Jane Fosters) reinforces the aliens’ oddity and adds a layer of humor. Without this humor, the film would be overbearing and plodding. While the scale of Thor in grandiose and contains the interaction of gods, giants, indestructible (but always destroyed) armor, regular humans and science (! ), it remains an enjoyable movie to watch. It takes a cue from comics and shows as well as tells. I am on record stating my dislike of Tony Stark as a character and am personally indifferent to Iron Man comics, that being said, I have come to believe that Robert Downey Jr is possibly the best Marvel superhero out there (I also firmly believe that he may or may not think he is actually Tony Stark and I am ok with that). Iron Man and Iron Man 3 (despite its newness), are examples of what movies can do to make me like a comic I don’t care for. My biggest gripe with Iron Man is that his comics origin always left something lacking to me. He is essentially Bruce Wayne in Marvel, at least on the surface. Fabulously wealthy, a bit of a public dilettante and obsessive. He doesn’t have the personal tragedy of Bruce though, he dad was just distant. He just gets kidnapped, has a heart condition and builds armor. That never struck me as interesting. Enter the first Iron Man movie. The movie does what most good movies do, it establishes its character, puts him through a trial and then deals with the fallout from that trial. There are nods to the comic origin without being overbearing. The effects enhance the characters instead of trying to make up for their deficiencies. Bonus points for introducing Agent Coulson. As with movies that involve sequels, there were drags, but by Iron Man 3, we pick up steam and deliver a sequel that seems to actually reinforce events the main character has gone through. Tony is forced to deal with the fallout from The Avengers and does so convincingly. The Iron Man franchise is helped by the talent and characterization of Downey and Gwyneth Paltrow. The ending to Iron Man 3 is a little cliche, but no less so than the endings to most comic series. 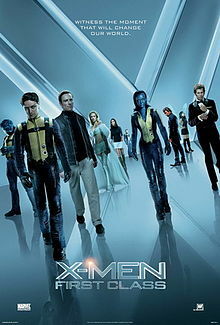 I would have no problem calling this movie the good X-Men movie. The feel is light, the characters are well designed and the acting from James McAvoy and Michael Fassbender is on par with that from Sirs Stewart and McKellen (the saving graces of the other 3 X-Men movies). As is a growing theme, the strength of this comics movie comes from its use of characters and also generally not taking itself too seriously. The film makes good use of it’s time period, political setting and certain expectations of the audience. It doesn’t expect the audience to really know who people are besides Professor X and Magneto. 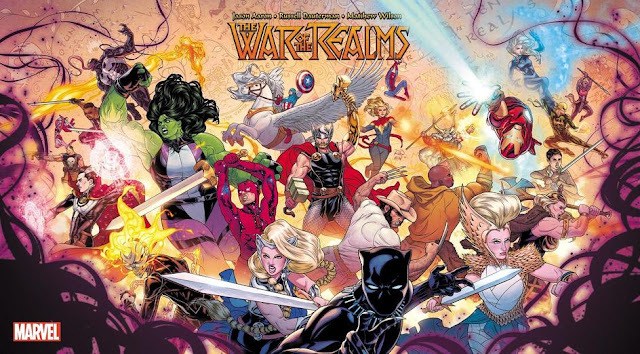 I, personally, wasn’t familiar with most of the team they put together except for Havok, Beast and Banshee. The Hellfire Club primes used as the main villains are over the top, but arguably with better dialog than they had in the Dark Phoenix Saga (seriously, go back and re-read it, I’ll wait). Ok, great, you’re back and realize, maybe, that those stories from your youth aren’t as well written as you thought. Anyway, First Class has some drawbacks (namely that January Jones is wooden instead of diamond), but overall it is what a comics movie should aspire to be: fun and rewatchable. 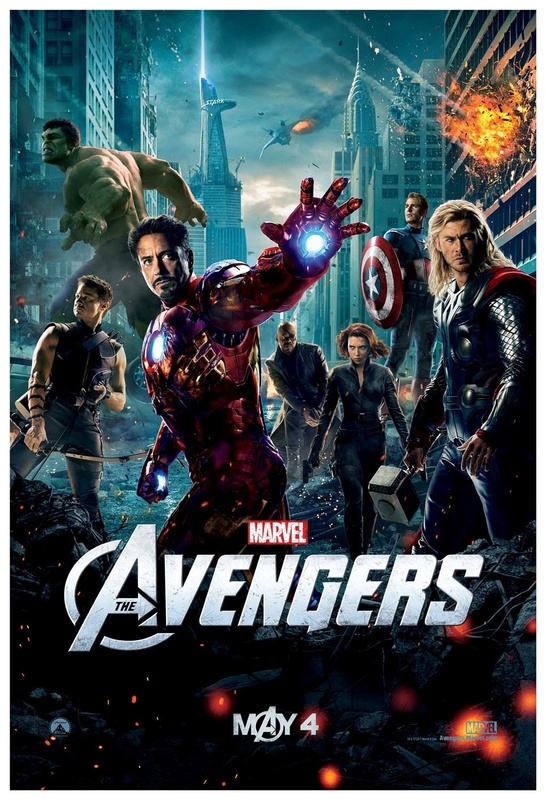 Yes, like I’m sure for the rest of the contributors, The Avengers was the highlight of my summer movies last year. As expected, lots of explosions, technobabble, mind control, allegiance changes, reluctant monsters and people in costumes (some good, some bad). What wasn’t expected was the scale and the chemistry in the film. You start with your basic premise: evil brother shows up to mess things up. You move from that (with big implosion - already changing expectations) to gathering a team. But this team isn’t something like a group of young teens brought together by an older gentleman to develop themselves and fight evil (which sounds terrible when you think about it). No, these people tend to not play nice together, whether it’s due to mind control, anger issues, ego issues (times 2) or timeliness issues. The flow of the movie is natural and there is some excellent acting. The framing introductory scenes for Black Widow, Cap and Banner showed you everything you needed to know about the characters without telling you too much. There are some ebbs (notably RDJ’s speech to Loki right before the final fight), but the scope, grandeur and characterization of the movie and that particular fight are extremely well-executed. As with good storytelling, action, dialog and effects enhance the story and don’t give you time to question some crazy things going on. If you’re looking for a unifying theme between these movies, I think it comes down to them doing something well. That something is being a movie about comics and not trying to be a comic on the big screen. They show instead of tell, develop characters and use the necessary effects to enhance the movie rather than prop it up. Comics and movies are different media and a good movie will be a good movie and do what those do best: explosions and funny voices. It's more like every "Every Marvel Movie and My Comment to Them"
It's a list of Matt's favorite comic movies, and he mentions the qualifiers for the list in his opening paragraph, and why he doesn't mention the Nolan Batmans and V for Vendetta. I went with movies I've seen and liked, if I didn't include a movie, it's probably because it failed that test.